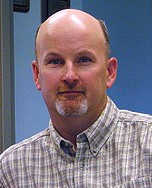 Wilkerson, M. S. (Scott), Ph.D.
Scott Wilkerson joined the Department of Geosciences at DePauw University in 1995 with a specialization in structural geology and tectonics. Prior to his appointment at DePauw, Scott was a senior research geologist with Exxon Production Research in Houston, TX from 1991-1995. Since arriving at DePauw, Scott has taught a wide variety of courses, including: Structural Geology & Tectonics, Map Interpretation, Geologic Field Experiences-Utah, Environmental Geophysics, Earth & the Environment, Geology of America's National Parks, and several First-Year Seminars and Winter Term courses and trips. Scott's research focus is understanding the 2-D and 3-D geometric and kinematic development of fault-related folds (using field mapping, computer/analog modeling, and cross-section balancing). He also is interested in visualizing topographic landforms and structural features using Google Earth and other software programs.